The new National Museum on the promenade walk in Oslo is a place for art, architecture and design. 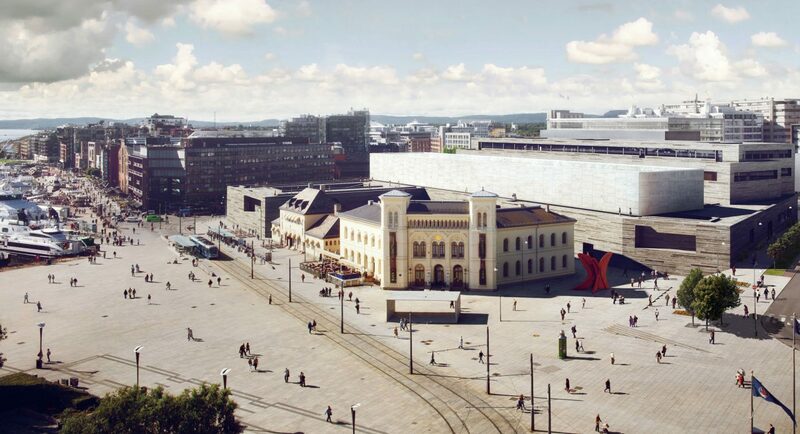 It will have space for collections which are currently spread around three separate locations in Oslo city center. The National Museum has an illuminated cube that is configured as a double facade in steel and glass. The conceptual design of the interior glazing is an all-glass facade consisting of laminated safety glass a unit size of 118 inches x 287 inches. Specially designed sliding elements are integrated in places. The facade cavity has a walk-on ventilation grille and serves as air conditioning. The outer facade is a post and beam design consisting of sharp-edged steel profiles with triple insulated glazing. The outer pane of glass is made from ceramic glass in order to produce the effect of what is known as the “Alabaster Hall”. The facade construction complies with Burglar Resistance Class 5 (RC5).